Alternate with my other lenses. They look stunning. I was concerned about how these would look with my very dark eyes. Felt re-assured after reading product information and reviews. These look great, only regret not getting them sooner. I bought the colour green. It would be good if the company could stock more colours and they seem to run out a lot. Only placed in eye to check colour change and if I can see (ie bought correct dioptric level) I wore contact lenses years ago so know how to clean, put in/out this may be helpful information to be available. Magic Eye (2 lenses) – dioptric. Coloured, sight corrective contact lenses for comfortable wear and easy application. Magic Eye are available in five different colours and should be replaced biannually. The delivery time for some colours can reach up to 4 weeks. I want the green ones Do you know where i can buy them or have you it? Unfortunately we don't sell these lenses anymore. What resembles these lenses? I am looking for the colored part to be bigger like these Magic Eye lenses , i purchased the Air Optics with the same diameter, and wasn't satisfied. Can you help me? Hi Aakriti, You should have received a mail from my Danish colleague. However, as far as I know, we are re-stocking all the coloured and crazy lenses in time for Halloween. Dear Helena, unfortunately we had to stop selling these lenses. All we have left is what's in stock. Can i buy these lenses from Pakistan? If yes then please let us know the distributor address. Can I wear these contacts more than once? Hi, Yes, you can wear these for up to 6 months if you store them correctly in a case with solution. Thank you! Hi, are these lenses dailies or reusable? Thanks. hi! Just wondering how long they last for if disinfected correctly after each use Thanks. Hello, do the magic eyes coloured contacts make the irises look larger? Hi. If I wear them say once/twice a week, how long will they last before I need to bin them. Presumably they are stored in just usual contact lens solution? Thank you. Thank you for this comment. They can be worn for up to 6 months, as long as they are stored in fresh solution after every wear. The solution must be replaced once or twice a week if you do not always wear them. I hope my reply helped. Happy to remain at your service! Can I use these for one month? Thank you for writing to us. Magic Eyes are recommended to be worn for 6 months period. However, please be careful as they need a constant and proper maintenance. Happy to remain at your service. Thank you for writing to us. They should be suitable for driving. However, your eye care practitioner, who issues you with a prescription for these lenses, should be the person who knows your eyes better. Hola, me gustaría saber como puedo seleccionar la opción de "hipermetropia", ya que la última vez que compré unas en esta página, me llegaron para miopia, y no me gustaría que volviese a pasar lo mismo, gracias. Muchas gracias por su email. Sentimos mucho que haya recibido las lentillas con miopía en lugar de hipermetropía, pero estas lentillas solo vienen para miopía, no se venden para hipermetropía (+). Sin embargo, hay otras marcas que sí vienen con la graduación que usted necesita. Le dejo los links aquí: https://www.lentiamo.es/…ensions.html, https://www.lentiamo.es/…-colors.html, https://www.lentiamo.es/…rblends.html, https://www.lentiamo.es/…aduadas.html, https://www.lentiamo.es/…-colors.html. Por favor, recuerde que para la miopía tiene que elegir el signo menos ( – ) y para la hipermetropía, el signo más ( + ). How long can we use this contact lenses for? Thank you for your comment. These lenses should be replaced biannually, so you can wear them for 6 months. After 6 months they should be replaced. If you have further questions please contact us at info@lentiamo.co.uk. Have a lovely day. Would these be suitable for someone who usually wears daily disposables? Thank you for your comment. It's difficult to say if they are suitable for someone who uses daily disposables or not. This is because everybody has a different set of eyes and they all react differently to using biannual lenses. What I would suggest you do is ask this question to your optician and they should be able to tell you if the lenses would be alright. If you have any more questions you can contact us again at info@lentiamo.co.uk. Have a nice day. it is not comfortable.i wear it in the trip,in halfway i started to feel painful in my left eyes,then i throw it away.it has a small cut in the lense. Thank you so much for your comment. We are deeply sorry to hear you had some problems with the lenses. Could you please send us by email a picture of the lens with the small cut? Our email is info@lentiamo.co.uk and we will be glad to help you. Thank you so much for your comment. The power is the parameter for the myopia or hyperopia. If you want, you can send me to info@lentiamo.co.uk a picture of your lenses with the dioptrics and I will tell you how to put them. If you have more questions, do not hesitate to contact us. Merci beaucoup pour votre commentaire. Vous pouvez utiliser n´importe quel solution parce que toutes que nous avons sont aptes pour toutes les lentilles sur notre site. Si je peux vous recommander une solution, je dirais celle-ci: https://www.lentiamo.co.uk/…th-case.html. Si vous avez plus de questions, n´hésitez pas de nous contacter. Hi, Yes, it does. But please be aware that the final outcome strongly depends on your natural colour and the lens colour you choose. Unfortunately we cannot provide you with the Magic Eye in Sky Blue. Perhaps you would be interested in other products from our range of coloured contact lenses. I am sorry I could not help any further. Can these be worn every day? Yes, these can be worn daily for up to half a year when looker after properly. Hi, These lenses are up to six months of use. They should be change after half a year. HI,i want to ask how long it can be used?1 month?1year? hello, to get a pair of lenses, I need to choose 1 right and 1 left, is that alright? There are two lenses in a box, so you can order just one box and you will get a pair. Hello. Yes, the box contains two contact lenses. Unfortunately, our delivery policy has changed and we no more supply to Turkey. http://www.youtube.com/watch?v=-Mp2bSoOyRk I'm looking for these lenses. Is this what you're selling lenses? Yes, these are the lenses you are looking for. ohhhh i see i need the once that help me see aswell.. so that means ill need (dioptric) ? what does (non dioptric) mean? Non dioptric means no powers/ no spheres/ Plano. In other words, you do not need a prescription for these. They are cosmetic lenses that enhance your look, they will not correct your vision. is it magic eye tricolor? 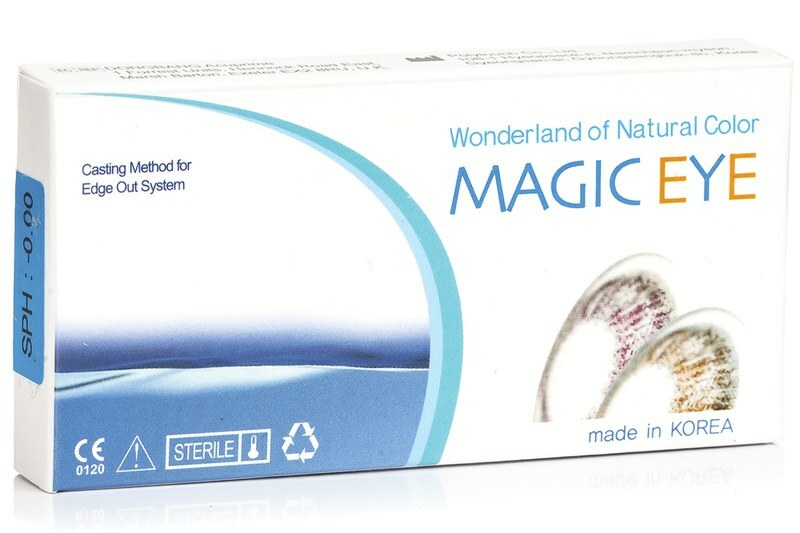 We sell these lenses as „Magic Eye“. However, some retailers may offer them under the name „Magic Eye Tricolor“.